I've been backpacking for nearly half a century, most often in the Rockies. I do at least one weeklong trip every summer, and often take three-day trips. I'm usually camping in alpine terrain, at altitudes 5000 to 10000 ft (1500 - 3000 m). I prefer base camp backpacking, a long hike in with day trips from camp. Though always looking for ways to reduce my pack weight, I still tend to include my favorite camp conveniences. I always sleep in a floored tent and like hot meals. Winter trekking often focuses on downhill skiing or ski touring. These are few-frills waterproof-breathable [WPB] pants that I use in the winter for hiking and ski touring. 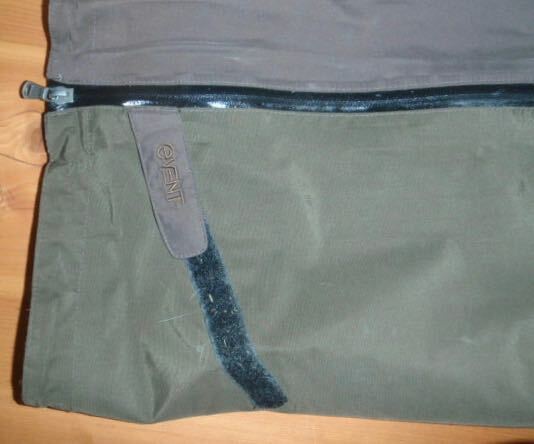 Since I purchased mine, at least ten years ago, the WBP fabric has changed from eVENT to Polartec NeoShell, but the description on 66 NORTH's website fits my pants very well. The frills that I use are an integrated webbing belt with a plastic buckle, full-length waterproof zipper on each leg, waterproof zippered fly, a single zippered pocket on the left hip, and Velcro ankle tabs for sealing out snow. The pants also have adjustable tabs at the waist, but I don't use these, leaving them at the most open position and holding them up with elastic suspenders. The description of the current product indicates that the side zips now go from ankle to knee. Manufacturer: 66 NORTH, Gardabaer, Iceland. Presumably located at 66 degrees north latitude. Website: 66north.com There are separate pages for different countries. MSRP: $375 in US; EUR 300 in Europe. Size: L. Available in S-2XL. Color: Brown. Now available only in black. WPB treatment: eVENT. Now Polartec NeoShell. Most of my use has been for cross-country skiing and ski touring. Since moving to Montana in 2012 most of that has been done in the Gallatin, Madison, and Bridger Ranges or in nearby Yellowstone National Park. There are several groomed ski tracks in and around Bozeman, one quite close to my house. Touring has been on-trail, off-trail, and breaking trail. I try to do my touring and day cross-country skiing under clear skies, though sometimes snowflakes can't be avoided. I can only recall one blizzard, on a hut-to-hut tour on the Idaho side of the Teton Range. I've also worn the Snaefells for winter day hiking, backpacking, and snowshoeing, in comparable conditions and locations. The Snaefells have seen temperatures as low as -30 F [-36 C] and many days and nights below 0 F [-17 C], and wind conditions from dead calm to mini-gale. Of course, in winter wind means blowing snow, especially here in the Northern Rockies where the cold smoke – featherlight powder snow - is irresistible to downhill skiers and a daily bother for trekkers on windy days. With or without snow, the winter winds here blow cold. The wind chill or similar misery indices are often well below the temperature. I wear these trousers over a lightweight merino base layer. They do fit over hiking shorts or pants but I prefer a lighter pair of trousers for use strictly as rain pants. That's the reason my use has been limited to colder weather, usually when there's snow in the air or on the ground. Another reason is how well the Snaeffels block the wind. Fit. The Snaefells fit me quite well. 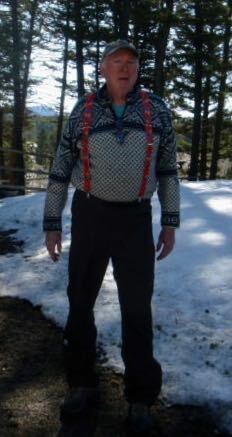 The waist, fully let out with the adjustment, is a bit bigger than my waist, enough to be comfortable even with a down or wool sweater tucked in. That goes for my bulkiest lined sweaters such as the one [Dale of Norway Storetind] reviewed on this site. With elastic suspenders clipped on I have excellent freedom of movement when turning, kicking, or gliding. By good luck – there are no separate choices for rise or inseam – the Large size fits nearly perfectly in the seat and in length. The top of the cuff sits atop a cross-country ski boot with no break but no exposed ankle. If breaking trail I can cinch up the Velcro cuffs to keep the powder out. Features. I've mentioned the adjustable waistband, which I don't use, and the Velcro cuffs, which I do and which work as intended. I do buckle the belt, mostly to keep the plastic buckle pieces from flapping about rather than to keep my trousers up. The pocket sometimes holds car keys but is too small for much else. That leaves the side zips. They are double zippers, operable from either end, and run from cuff to just below the waist. They are waterproof, seam-taped, and backed by a storm flap. The taping and stitching remain intact after at least ten winters' hard use. Every fall and spring I have treated the zippers with WD-40 [a lubricant] and I cannot recall a single incident of sticking. 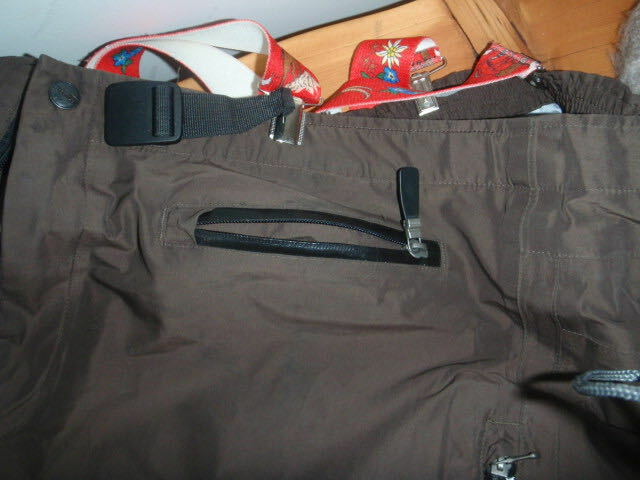 I use these zippers to regulate ventilation and, whenever I am wearing my telemark skis, to put on or take off kneepads. Weatherworthiness. Simply outstanding. These trousers block the wind and snow wonderfully well, yet allow perspiration to wick away quickly. eVENT has always been a personal favorite WBP treatment, as several other of my reviews and test series on this site will attest. Three weeks ago, shoveling and blowing my long driveway at 40 F (4 C) in the sun, I didn't need to open the side zips. Every year or so I'll re-treat the Snaefells with an aftermarket WPB refresher, and I do wash them a couple of times a winter as recommended by their maker, to enhance the fabric. I make no judgment on the new fabric, as I've never had the opportunity to check it out. The eVENT has been terrific. Durability and Care. Ten-plus winters speak volumes. The Snaefells don't look like new but I have detected no loss of functionality. This impressive performance has come without any special treatment. As noted I do wash them from time to time, always in cold water with non-detergent soap, and give them a spin in the dryer on moderate heat. Nothing out of the ordinary for my WPB garments. But their performance has been anything but ordinary. A cargo pocket big enough for a cap, a small tube of sunscreen, and a neck gaiter.